The topic for the 52 Ancestors challenge this week is “Good Deeds”. I was somewhat stymied. I have not done much property research on my ancestors. I’ve only found a couple of deeds and have written about those previously. I decided to go with the second meaning of this prompt and focused on someone who did good. 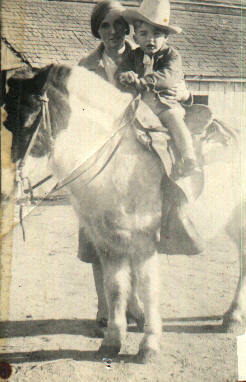 The young woman in this photo was known as Anna (Jackson) Smith at the time it was taken in around 1931. We knew knew her as Grandma Shellabarger. She was barely 18 and married about two years. Her son, Donald, was probably just hitting his second birthday. The Depression was in full swing. My Grandma was a somewhat pushy woman with an obstinate streak. But, she could laugh hysterically at the slightest thing–a trait she shares with my Mom. Despite her obstinance, she had a soft spot for those who were in need. 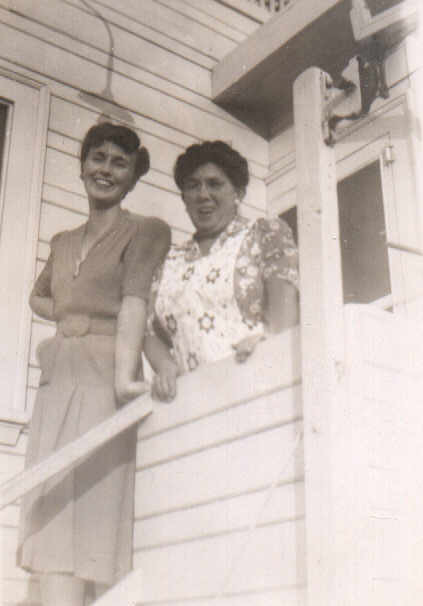 The second photo shows my grandma with my mom sometime around 1936 a few months before they left Salinas to return to Oakland. 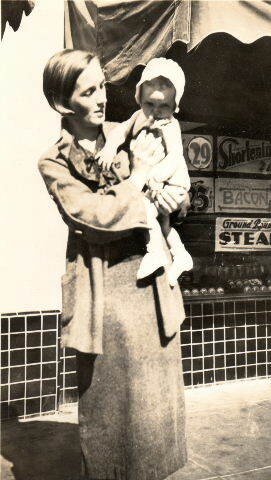 My grandfather’s job on the sugar beet farm and my grandma’s job sweeping up at a beauty salon had come to an end. They needed to return to the city for work. Back in Oakland, working as a housekeeper, she made 33 cents and hour. Her husband, Joao “Bohne” Pacheco Smith made 31 cents an hour digging graves. It was a source of contention in their relationship that she made more than him. You wouldn’t think they wouldn’t have much to give away. But, my Grandma did just that! The homeless showed up on their doorstep begging for food on a regular basis. My grandmother never turned them away. Though they had very little money, they had a vegetable garden and chickens. They were well fed by Depression era standards. She would make a plate of food and the man or woman would eat out on the porch or on the sidewalk. One time it was a family that had driven all the way from the Midwest. They had no water for the radiator of the car so they urinated in a jug and kept the car going on that. She fed them all. My grandfather was not happy about what he saw as food leaving their table. He didn’t have a problem with the occasional person drifting by, but they were becoming a steady stream. One day he took my grandma outside to show her something. He pointed to a mark on the sidewalk in front of their house. It was a mark the hobos left behind. It meant that the people inside would provide them a meal. He felt that my grandma’s kindness was being taken advantage of. But, she couldn’t turn anyone away. So many were starving. In fact, on top of the homeless that she fed, she also made an extra meal for the elderly woman who lived next door on E. 25th Street. My mom told me that the houses were close together and grandma would pass the dinner plate to the woman through the kitchen window. This is one of my favorite photographs. It shows Grandma and her sister-in-law, Maria (Pacheco Smith) Souza/Correia on the Souza stairs. They are enjoying a pleasant moment. My grandma’s kindness must have rubbed off on my mom. We were always encouraged to think of those less fortunate. We didn’t really have much ourselves. Yet, we would routinely clean out closets and drawers to give away outgrown shoes, clothing, and toys to the needy. One year, a relative’s house caught on fire. I remember taking bags of stuff to Santa Cruz that they could use to start over. If you couldn’t use it, someone else could. My Mom believed that. She also believed that you never knew what life would deal you. You would want others to show you the same kindness if you were down on your luck, wouldn’t you? That is the lesson my grandma taught my mom and she taught us. There will always be someone in need, someone less fortunate than yourself. There will always be someone who can use a little kindness.